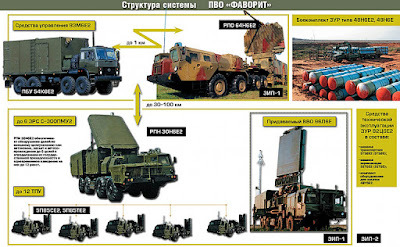 Russian brochure for the S-300-PMU-2 "Favorit"
The Russians hastily delivered to Syria three battalions of a version of the S-300 air defense system that is not normally exported. Having second thoughts, Russian technicians are now converting the system to the less capable export version. Although still a lethal system, it is not the "latest and greatest" as that used by Russian troops. Almost immediately after the mistaken downing of a Russian Air Force intelligence collection aircraft during Israeli operations near Syria's Mediterranean coast, the Russians began a massive airlift to deliver three battalions of the very capable S-300PM-2 (NATO: SA-20 Gargoyle) air defense missile system. These systems were recently withdrawn from service and placed in storage. According to Russian media, the weapons originally belonged to the 531st Antiaircraft Missile Regiment based in the Alexandrovsk district of Murmansk Oblast in the Russian Arctic. The systems were accompanied to Syria by Russian air defense troops where they were to train Syrian operators. At some point, the Russian technicians and advisers tasked with standing up the air defense system in Syria realized that the system was not the downgraded export version known as the S-300PMU-2 (NATO: SA-20B), but the more capable S-300PM-2 version authorized for use by only Russian air defense units. In order to safeguard some of the advanced electronics from possible acquisition and exploitation by potential adversaries (read: American, British, and Israeli), the Russian technicians are now removing some of the more sensitive Russian-only components from the system. When completed, the newly-acquired air defense systems will have been converted to the S-300PMU-2 export standard. 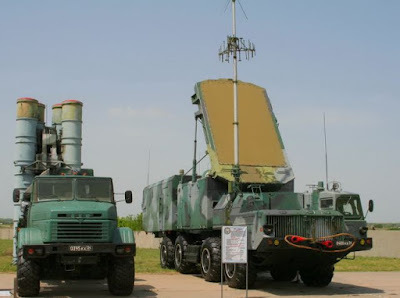 There is one notable exception, however - the Russians are leaving the more advanced target detection radar and identification-friend-or-foe (IFF) system associated with the Russian-only S-300PM-2 in Syrian hands. Why change the modes and codes, in essence "dumbing down" the system? Simple. The Russians are not the only air force in the region with sophisticated signals intelligence (SIGINT) capabilities. The Russians do not want their most advanced electronic systems in the hands of demonstrably incompetent Syrian troops whose use of the system will transmit the capabilities of their air defenses to the antennas of Western intelligence agencies. In addition to the Russian Air Force Il-20M (NATO: Coot-A) electronic intelligence (ELINT) platform - like the one mistakenly downed by a Syria S-200 (NATO: SA-5 Gammon) missile that prompted the S-300 delivery - at a minimum, the Israelis, the United Kingdom, and the United States operate a variety of airborne collection platforms that can easily access the S-300's electronic and communications signals. While the Russians have deployed Russian-only S-300 and S-400 systems with their own forces in Syria, they have been extremely judicious in their use to limit Western access to system capabilities. The S-300PMU-2 Favorit - the system that the Syrians will eventually own - can track and engage multiple targets out to a range of over 100 nautical miles. Remember that it is not the range of the S-300PMU-2 system that is the threat, it is the improved capability. The existing S-200 missiles in the Syrian inventory have a longer range (190 miles versus 108 nautical miles), but it is the lethality of the S-300PMU-2 missile system and its ability to operate in a dense electronic warfare environment that make it more dangerous. It remains to be seen just how the Syrians will integrate the new system into the existing Syrian air defense network, but it will certainly raise the threat to Israeli and U.S.-led coalition aircraft. That said, Syria's new capabilities will be more in line with the air defense capabilities of other countries that have been sold the S-300PMU-2 system, many which have trained with (and against) U.S., NATO, and Israeli pilots. For a more thorough analysis on the S-300 system, please see the "airlandbattle" article here. After the amazing, but not unexpected, revelations made today in the case of the disappearance of Saudi activist Jamal Khashoggi (khashuqji), I need to change the title of my original analysis. As many of you who have traveled in the Levant and Arabian Peninsula are aware, mansaf is a traditional Arab dish made of lamb cooked in a sauce of fermented dried yogurt and served with rice or bulgur. In this case, the mansaf being prepared in the royal palaces in Riyadh tonight features sacrificial lamb, or possibly even scapegoat. Meet the two senior Saudi officials who will likely bear the brunt of the blame for what we are to believe was a botched interview at the Saudi consulate in Istanbul, Turkey, that resulted in Khasshoggi's death (photo above). On the left is a key advisor and communications chief to Crown Prince Muhammad bin Salman, Sa'ud al-Qahtani. According to his profile on Twitter, al-Qahtani is (among other things) "an advisor to the royal court in the rank of minister, and supervisor of the Center for Studies and Information Affairs..." He is believed by critics to be the one who lured Jamal Khashoggi to the meeting in Istanbul. This presents a problem for the Crown Prince. On al-Qahtani's Twitter page is this entry from last year when he was accused of acting without proper authorization. My interpretation: Do you think I do these things without guidance? I am an employee and a faithful executor of the orders His Highness the King and of His Royal Highness the Crown Prince. We are now to believe he has been relieved of his position for acting exactly as he claims he does not. On the right is the officer whose name we have seen from the beginning of this explanation, who until today was the Deputy Chief of the General Intelligence Directorate (GID, al-istikhbarat al-'amah) Major General Ahmad Hasan Muhammad 'Asiri. 'Asiri, a 66-year old officer in the Royal Saudi Air Defense Force, has only been in the deputy GID position for little over a year. It would appear that the 15-man team that deployed to Istanbul were his subordinates - most if not all of these officers have been arrested along with 'Asiri. Just as President Donald Trump alluded earlier this week, the official story from Saudi Arabia - from King Salman himself - will be that this was in fact a "rogue" operation either directed by or acquiesced to by Minister al-Qahtani and General 'Asiri, despite the earlier profession by al-Qahtani that he only follows orders. The king will try to protect his son Crown Prince Muhammad from being implicated. I believe this will be a stretch. I do note that the King's other son (and full brother to Muhammad) Khalid bin Salman, the current ambassador to the United States, has been recalled to the kingdom to assist in the investigation. If the king cannot protect Muhammad, he may have to remove him from the line of succession, possibly in favor of Khalid. If this happens, Khalid is on hand in Riyadh. Realpolitik will hold the day. There will have to be some consequence for Saudi Arabia - there have been several proposals, such as Global Magnitsky Act sanctions on some Saudi leaders, and a stand down of some American military and intelligence support for Saudi operations in Yemen. I believe the bottom line is that the U.S.-Saudi relationship is too valuable to Washington (or should I say President Trump?) at this time as we are trying to exert additional pressure on Iran to curb its missile research and development, and force them back to the nuclear negotiating table. At the same time, it is important that we maintain our (strained to be sure) relations with Turkey and the mercurial President Recep Tayyip Erdoğan. It would be useful if we could help heal the rift between Ankara and Riyadh. The next few days and weeks will be difficult, but in the end, the relationship between Washington and Riyadh will survive this as it has survived other crises in the past. In a stunning turn of events, numerous news outlets are reporting that the Kingdom of Saudi Arabia will issue a report acknowledging the death of Jamal Khashoggi as the result of an interrogation that went bad. According to Russian media, citing Saudi Ministry of Foreign Affairs officials, Khashoggi died from a "suspicious" heart attack during interrogation at the Saudi consulate in Istanbul, Turkey. At least the Saudis are no longer pushing the myth that he left the consulate after a short visit. Anyone who has served in any intelligence, internal security or national-level law enforcement service knows that foreign diplomatic missions - embassies, consulates, legations, etc. - are under constant surveillance. That surveillance includes visual and electronic monitoring. In every assignment to embassies and consulates I had over the years, I just assumed that I was being watched and monitored at all times. In some countries, it was obvious. The Saudis must have known that their consulate in Istanbul was the subject of Turkish intelligence service surveillance. I think the Turks compromised their surveillance operation against the consulate by claiming to have audio tapes of the interrogation and subsequent murder of Khashoggi. The Turks' story about retrieving the audio from an Apple watch is ludicrous - even the Saudi intelligence service (not highly competent by any measure except maybe arrogance) would have made sure Khashoggi was not wearing any sort of device that could record the event. In addition, that suggestion was debunked by technical analysts. I am surprised the Saudis were not able to detect and defeat what must be a Turkish intelligence service audio penetration of their facility. Then again, I have worked with both the Turkish national intelligence organization (Millî İstihbarat Teşkilatı) and the Saudi military intelligence directorate. While neither are particularly good at foreign intelligence collection operations, they do excel at supporting internal security in their countries. In Saudi Arabia in particular, the function of the intelligence services is not to collect information on foreign military threats to the Kingdom, it is to develop intelligence on threats to the royal family and its continued rule. From personal experience, the United States intelligence agencies have repeatedly diverted valuable collection assets to assuage Saudi fears of a perceived coup against the ruling family. That said, why would the Saudi intelligence apparatus concern itself with a journalist turned op-ed writer and political activist living in the United States? Jamal Khashoggi* was once a prominent Saudi and at times an advisor to the royal family. In 2017, he left the kingdom after becoming a vocal critic of the government, in particular the newly-named Crown Prince Muhamad bin Salman, commonly known in the West as MBS. Criticism of MBS is a sensitive issue in the kingdom, as his ascendance to the throne upon the death of his father King Salman bin 'Abdi al-'Aziz will be the test of the Saudi succession beyond the sons of the kingdom's founder. A smooth transition from the first to the second generation is essential to the ruling family's retention of power. Since King Salman named his son as crown prince, both father and son have made sometimes astute and sometime not so astute political moves to consolidate support for the eventual transition of power. This has included a series of high-profile arrests - who can forget the spectacle of the Riyadh Ritz Carlton hotel being used to detain some of the richest men in the country? - as well as placing close allies in key positions. By way of example, in April 2017 King Salman named his second son, Khalid bin Salman, to be the ambassador to the United States, arguably one of the most important diplomatic positions in the kingdom. - Saudi Arabia - King Salman names his son as crown prince. Turkish officials have accused Saudi Arabia of sending a team of 15 men (photo left), mostly military intelligence officers, to interrogate and kill Khashoggi and dismember his body with a bone saw before flying it back to his native country. I find this hard to believe, but it is hard to argue with the facts as presented by the Turks. There were two charter flights, numerous rental cars, video surveillance, as well as the claim of audio recordings of the actual event. On the face of it, it appears that the Saudis have committed premeditated murder. That said, I cannot for the life of me fathom why the Saudis would kill Khashoggi - he was not that big of a deal. For argument's sake, let's assume that at some level in the Saudi government, a decision was made to eliminate Khashoggi. That would have come from a senior official, likely someone in the diwan (royal court). Was it the king, the crown prince, director of general intelligence, the minister of the interior? While we may be told a name, we may ever know the truth. It may be that Crown Prince Muhammad bin Salman directed the intelligence director to "take care of" Khashoggi and that set a series of bad decisions in motion. I have met King Salman, and am familiar with MBS - neither are stupid. I am hoping that this was all a terrible chain of mistakes. However, the two leaders still bear the responsibility for these actions. There will be consequences. * If the name Khashoggi sounds familiar, it should. Jamal's uncle was Adnan Khashoggi, the billionaire arms dealer implicated in the Iran-Contra affair. Jamal Khashoggi* was once a prominent Saudi and at times an adviser to the royal family. In 2017, he left the kingdom after becoming a vocal critic of the government, in particular the newly-named Crown Prince Muhamad bin Salman, commonly known in the West as MBS. Middle East analysts have been waiting to learn what variant of the capable S-300 air defense system was delivered to the Syrian armed forces over the last few weeks. This should be read in conjunction with my earlier article, Syria to receive S-300 air defense system from Russia. Almost immediately after the September 18 mistaken shoot down of a Russian Air Force IL-20M electronic reconnaissance aircraft by a Syrian air defense S-200 (NATO: SA-5 Gammon) missile while Israeli Air Force fighter bombers were operating off the Syrian coast, Russia announced that it would provide the S-300 system to their Syrian allies. The Russians are assuming that the advanced electronics (including better friend-or-foe capabilities) of the S-300 will preclude future incidents such as this. I have spent much of my professional life studying the Syrian armed forces, especially the air force and air defense. It's not the systems the Syrians are using that is the problem, it is the lack of training and competence in the operation of even these older systems. Add to that the atrophy of the Syrian military caused by seven years of civil war. The S-300 is a large family of air defense systems, dating back to the initial deployment of the original S-300P (NATO: SA-10 Grumble) system in 1978. According to TASS, citing military sources, Russia delivered three battalions of the S-300PM (NATO: SA-10C Grumble C) surface-to-air missile system. Each firing battalion of the S-300PM consists of eight launchers, for a total of 24 launchers. As far as I know, the article in TASS (click on image above to read the article) was the first semi-official report of the exact variant delivered to the Syrians. If true, it underscores the Russian leadership's commitment to provide an enhanced air defense capability to the Syrians. The S-300PM battalions are not the export version, but refurbished regular versions formerly used by Russian air defense units that have now been upgraded to newer systems. Given the flight paths of the Russian Air Force AN-124 (NATO: Condor) heavy lift aircraft used to deliver the systems to Syria, it appears that these systems came from units in the Murmansk area. The S-300PM is an upgraded version of the S-300P; it entered service around 1990. It is intended to defend against aircraft, cruise missiles, and ballistic missiles. According to the military source, Russia delivered over 100 surface-to-air guided missiles for each battalion. That is a lot of missiles, which partially explains the high number of AN-124 flights to Syria in a short amount of time. The entire system - command and control center, three firing battalions and extra missiles - was delivered in about 10 days. If in fact the missile battalions provided to the Syrians are the S-300PM, it does not pose as great a threat as the expected S-300VM "Antey-2500" (NATO: SA-23 Gladiator Giant). That said, the S-300PM is a capable air defense system and does complicate planning for both Israeli and U.S.-led coalition air planners. The Russians build excellent air defense systems - the presence of the S-300PM should not be taken lightly. That said, there will be a long and steep learning curve for the Syrians to effectively use this (or any) system, and NATO and Israeli aircrews have flown against the export version of this particular system in the past. 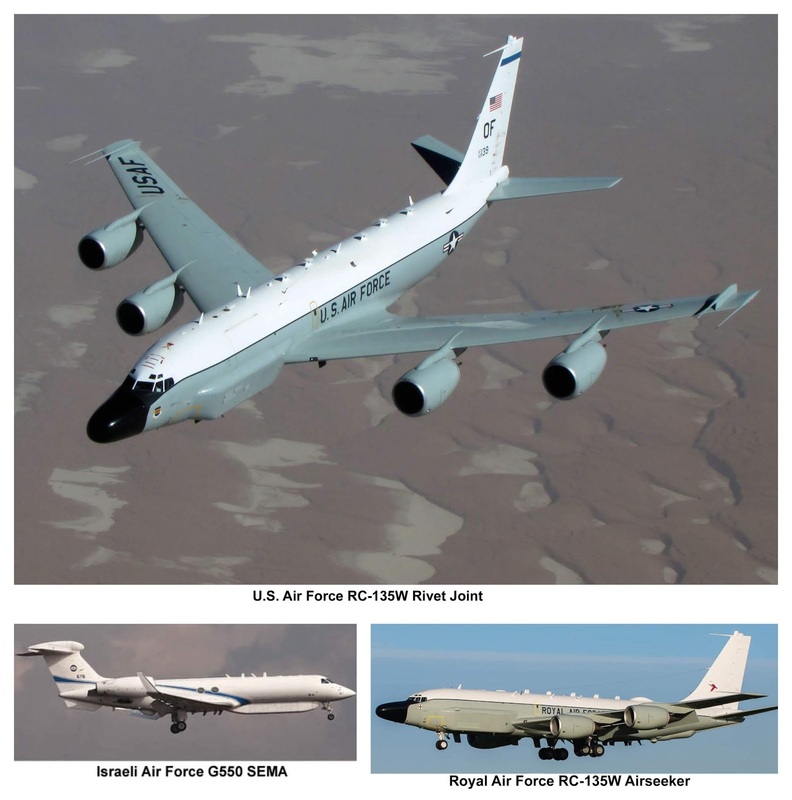 Humaymim or Khmeimim Air Base - what's in a name? Since September 2015, the Russian Air Force has maintained a large presence at a Syrian Air Force base south of the major port city of Latakia on the country's northeast Mediterranean coast. The name of the base - حميميم‎ - is transliterated in English as Humaymim, and in Russian as Хмеймим, although it is often seen in the media as Khmeimim. The air base is located approximately 12 miles south of the city of Latakia adjacent to the small village of Humaymim (population 3700). For map nerds, its location is 352411N 0355659E. The Russian presence at the base is roughly equivalent to that of a U.S. Air Force expeditionary wing. The Russians have used the base not only for support of their forces in Syria, but as a staging/stopover base for military and diplomatic flights to Europe and Africa. The air base shares airfield facilities with Martyr Basil al-Asad* International Airport, which serves the city of Latakia and is in the homeland of the 'Alawi religious sect to which the al-Asad family belongs. The base has undergone major improvements since the Russians basically took over the base - runways have been extended; new taxiways, aprons, aircraft maintenance hangars, admin buildings, and barracks were built; and state-of-the-art air defense and electronic warfare systems deployed. Humaymim is also home to the Syrian Navy's 618th Maritime Warfare Squadron, which operates Mi-14 (NATO: Haze), Ka-25 (NATO: Hormone), and Ka-27 (NATO: Helix) antisubmarine warfare (ASW) helicopters. During the seven-year Syrian civil war, these ASW helicopters have been used to drop naval mines on civilian targets. In 2017, Russian President Vladimir Putin secured a 49-year renewable lease for Russian use of the air base, as well as a 49-year extension on an existing lease for use of a naval facility at the port of Tartus, about 30 miles south of the air base. 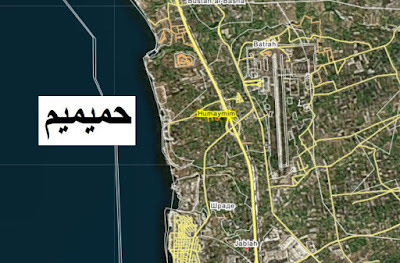 As noted above, the true name of the Syrian air base is حميميم‎. People will ask how it is spelled - the Arabic script is the actual spelling. What they are really asking is how is the Arabic name transliterates into other alphabets - Latin, Cyrillic, Hebrew, etc. The differences in transliteration not only cause confusion, but at times have placed American forces at risk. In addition to being an extremely difficult language to learn**, the Arabic alphabet creates its own set of problems. The writing system consists of 28 consonants; the three vowels are not normally written. As with Hebrew and the other languages that use the basic Arabic alphabet (Persian, Urdu, Malay, etc. ), the script is written from right to left. The problem is how to properly transliterate the Arabic script. Although there is only one correct spelling in Arabic, converting it to something readable in Latin letters can be confusing. For example, was it Saddam Hussein or Saddam Husayn? Technically, neither can be correct/incorrect since the actual spelling is the Arabic letters hah sin yah nun. Most media used the transliteration Hussein, although Husayn is closer to the Arabic script. The United States intelligence community is required to use a standardized system, especially in the era of computerized databases that require specific letters. That system is the U.S. Board on Geographic Names (BGN) transliteration system developed jointly with the government of the United Kingdom. See Romanization of Arabic for a technical explanation of the system. An example of the consequences of not adhering to the mandated system is the U.S. Army destruction of an Iraqi munitions storage depot in the days immediately following the end of the Gulf War in 1991. Operating under orders to destroy all Iraqi military facilities in the area under coalition control, Army officers checked the databases to determine if the Al-Khamisiyah depot was used to store chemical weapons. Unfortunately, the records indicating that artillery shells filled with the nerve agent Sarin were stored at Al-Khamisiyah were filed under a different – and non-BGN – transliteration. When the facility was blown up, American forces (me included) were exposed to low levels of the nerve agent. So, while the media prefers to use the transliteration Khmeimim, the better transliteration - and that mandated for official U.S. government use - is Humaymim. * The late Basil al-Asad was the older brother of Syrian President Bashar al-Asad, who until the time of his death in an automobile accident in 1994, was being groomed by the brothers' father Hafiz as the successor to the presidency. Following Basil's death, the mantle of heir apparent was passed to the next eldest brother (Basahr). Although the President's presumption of the dynastic selection of his son as the next president did not sit well with many Syrians - the ones who were under the delusion that the Syrian Arab Republic actually had a democratic government - they really had no vote. ** The State Department's Foreign Service Institute considers Arabic to be a Category V language, the most difficult for native English speakers to learn. The others are Chinese, Korean, and Japanese.